1. Sign in using your Twitter account to see drawing editor. 2. Start drawing, you can select brush color & width from right menu. 3. Once drawing is done, add comments & post on Twitter in single click. 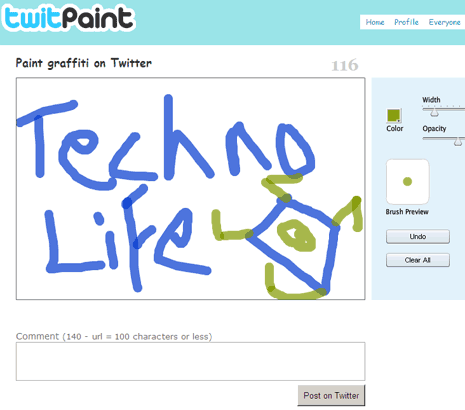 Unlike other services to share images on twitter, TwitPaint allows you to create paint graffiti images online and then share with Twitter friends in one go. Get the wild drawing designer out and splash N share your creativity using TwitPaint. There is even gallery to see graffiti creation by other users and get some quick inspiration.